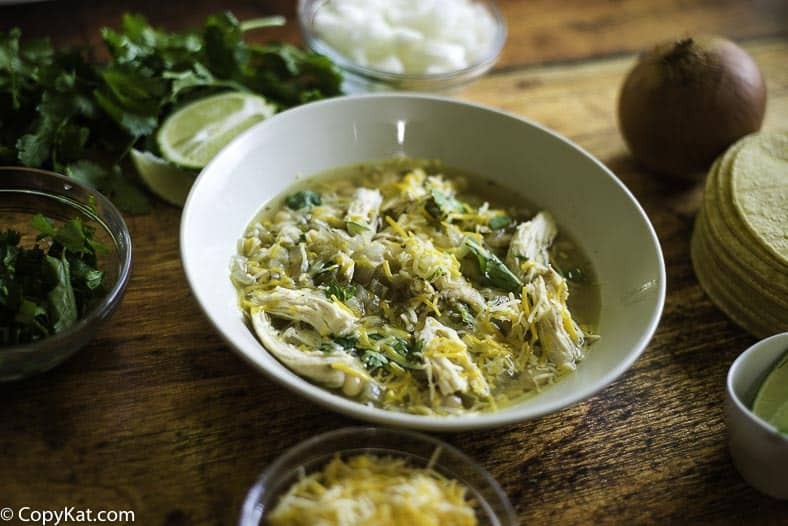 This is a white bean chicken chili, you may want to try something different. White beans, chicken, onions, garlic, and more go so well in here. You can also keep this recipe warm in a crockpot. If you were to guess, you might think that white chili is southern comfort food. After all, it’s a fact that chili made with white beans has been simmering on Southern stovetops forever, with chicken or turkey being favorite additions. However, it’s more accurate to say that white chili originated in the southwest. Many people think that chili originated in Mexico, but chili was originally made with beef and sold in San Antonio, Texas in the late 1800s. The name chili comes from the Spanish chile con carne, which translates as “pepper with meat.” The first white chili popped up out west in the late 1980s, where it was viewed as a variation on southwestern cooking. White bean chili was new – a sophisticated way to impress your dinner guests. It has been fully embraced by Southern cooks because who doesn’t love chili? And, who doesn’t like the idea of adding chicken? What type of White Beans should you use in chicken chili? There are four varieties of white beans. They can be used interchangeably in recipes. So, for example, if a recipe calls for navy beans, and you only have great northerns on hand, your dish will still come out just fine and taste delicious. Navy (Pea) Beans – Small, oval-shaped, and cook quickly. They get creamy when cooked, making them perfect for thickening soups and stews, or pureeing in dips. Great Northern Beans – Medium-sized beans with a mild, nutty taste and firm flesh that means they hold their shape better than navy beans. Cannellini Beans – Larger and meatier. Because of their shape, they are sometimes referred to as white kidney beans. They are often used in Italian dishes like Minestrone. Baby Lima Beans – Also called butterbeans. Small, smooth, and creamy with a rich, buttery texture and starchier. In the south, they’re often prepared with bacon or ham and served over rice. Add a crunch with sliced radishes. Make it colorful with avocado, tortilla chips, cilantro, and cheese. Add a little magic with a small garnish of salad – arugula, cilantro, tomatoes, avocado, red onion, a squeeze of lime juice, a drizzle of olive oil. Can’t get enough of chili? Here’s a whole bunch of hearty chili recipes. This is the perfect dish to make if you are busy. You can leave it happily simmering away while you clean the house. Lift the lid and your kitchen will be filled with the zesty aromas of the Southwest. It’s also good to make ahead of time and will keep for a long time in your freezer. 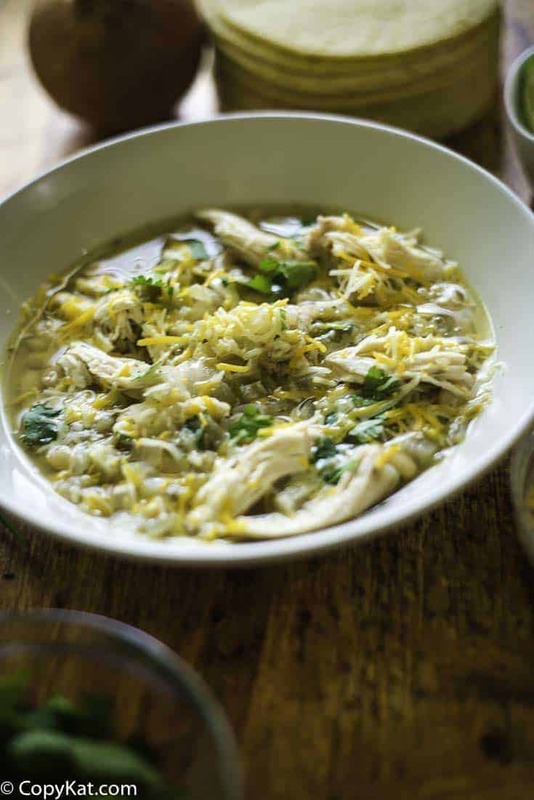 You will love this white bean chicken chili. 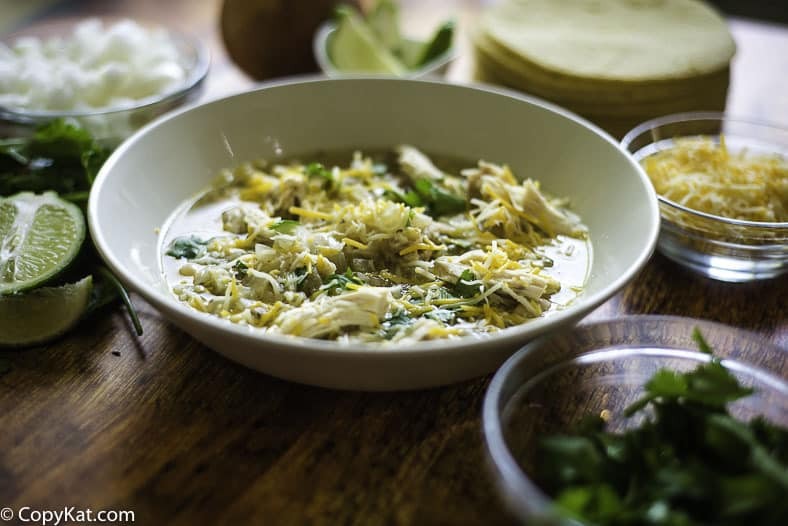 You will love this white bean chicken chili. Heat olive oil in a saute pan over medium heat. Add garlic and onions to pot and saute for 8 minutes. Transfer garlic and onion to a crock-pot and add remaining ingredients. Cook on low for 3-4 hours on low. Remove chicken breast, shred, and replace. Cook for another 1-2 hours on low.Garnish with your choice of the following: green onions, shredded cheese, diced tomatoes, sliced avocado or sour cream. I have searched everywhere for WBCC from Olga’s restaurant. I made this WBCC & it’s good & filling. It’s also 0 points on Weight Watchers, so I’ll make it again, of course. Give Olga’s WBCC a try, pretty please. Thank you for your suggestion. I will keep it in mind. I am glad you liked this recipe. 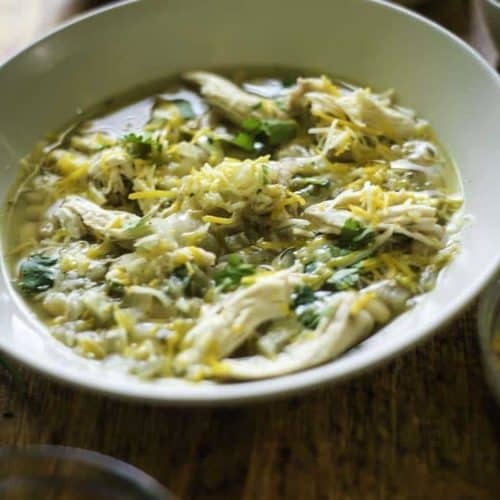 Would love to have the white bean chicken chili recipe from the Blackeye Pea Restaurant in Houston, Texas. Thank you for your request. I think the one near me closed. Great suggestion, I appreciate it.